U.S. Senate Majority Leader Mitch McConnell addresses our Fly-in audience as Sen. Todd Young awaits his time at the podium. The Indiana Chamber’s annual trip to Washington coincided with all eyes on the Senate Judiciary Committee hearing involving the Supreme Court nominee. 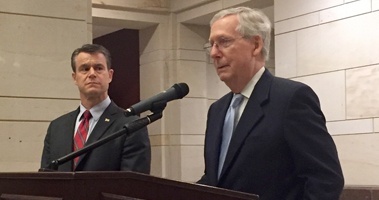 On Wednesday night at the dinner portion of our event, Senate Majority Leader Mitch McConnell of Kentucky touched on the duty of the Senate related to judicial nominees and the rarity of the current Republican control in the White House and both bodies of Congress. Our D.C. Fly-in legislative briefings featured areas of great interest to the business community. Indiana’s member on the House Ways and Means Committee, Jackie Walorski (IN-02), addressed the growing impact of the Trump administration tariffs on the state’s employers and how her district, with its strong manufacturing base, is bearing the brunt. She mentioned she’s been keenly focused on this from the get-go and has been consistently speaking with the President, including in at least four face-to-face meetings. The Indiana Chamber is highly concerned about what tariffs are doing and will do to the state’s economy and appreciates Walorski’s efforts and those of the entire delegation for delivering that shared message to the President. Congresswoman Susan Brooks (IN-5), a member of the House committee debating health care issues, talked about trends in that area and the effect of the opioid epidemic on Hoosiers and the Indiana workforce. Regarding opioids, Brooks stressed how the state and “every community, every county I represent does have a significant focus on the issue.“ She talked about the workforce impact and “seeing help wanted signs” from employers. Early this year, the Indiana Chamber and Wellness Council of Indiana announced the Indiana Workforce Recovery initiative, a strategic partnership with Gov. Eric Holcomb and his administration to combat the opioid epidemic. The mission of the Indiana Workforce Recovery initiative is to empower the business community to play a lead role by educating and guiding employers through the steps they can take to help their workers. Congressman Jim Banks (IN-03) outlined what’s going on with immigration. He said if he’s learned anything in the 21 months he’s been here “it’s how complex immigration policy can be”, citing the trend to roll virtually every possible aspect into one bill an “immovable object”. Still, he notes that despite disagreements on the subject, there are several areas where there is “consolidated, broad – even bipartisan – support.” Heading that list is securing the border. “Currently there are over 11 million illegal immigrants in this country, accounting for 3% of our overall population,” Banks noted. Meanwhile, Rep. Pete Visclosky (IN-1), took on the topic of environmental matters. He said that “as we transition economically, we need to use carbon as intelligently as possible, to understand it still has an outside presence in our economy and not to simply wish it away.” Visclosky also noted his believe in climate change and talked about what that has done. Additionally, we were pleased to have with us Ed Mortimer of the U.S. Chamber; he wrapped up the briefing segment with a look at recent wins achieved in the transportation arena and the need for a long-term, sustainable infrastructure funding bill – something the Indiana Chamber has been pushing for years. The event once again took place in the Congressional Visitor Center Atrium. 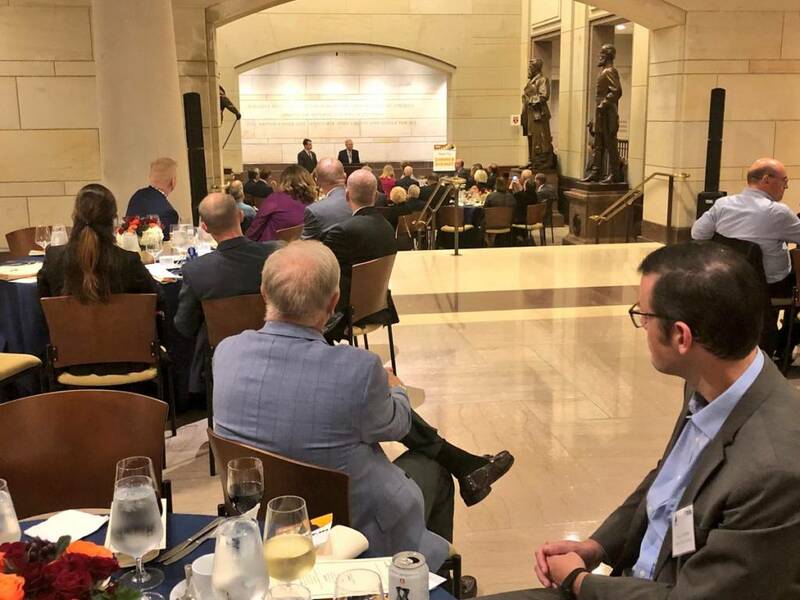 In addition to the Senate Majority Leader, both of Indiana’s senators – Joe Donnelly and Todd Young – addressed the crowd at dinner, where Congressman Luke Messer (IN-6) provided the invocation. Also on the evening agenda was Neil Bradley, executive vice president and chief policy officer of the U.S. Chamber. He touched on how recent tax and regulatory reforms have fueled growth, plus looked ahead to issues like immigration, trade and transportation that hopefully will be taken up by Congress next year. Bradley also examined what’s at stake in the midterms. On day two at the breakfast briefing, Kirsten Hillman, Canada’s deputy ambassador to the U.S. offered insight on the Indiana-Canada trade relationship; Indiana is Canada’s top trading partner and she spoke of the overall importance of the two countries continuing to work together. The Fly-in concluded with visits to congressional offices to meet with key staff and legislators; Young and Rep. Larry Bucshon (IN-8) were among the delegation members who personally took part in these. Our appreciation goes to Indiana’s congressional delegation, guest speakers and sponsors for making the event possible. The 2018 sponsors were: Zimmer Biomet (dinner), Smithville (legislative briefing), Build Indiana Council (cocktail reception), AT&T, Duke Energy, The Kroger Co., Old National Bank, TRISTAR and Wabash Valley Power.